I was reading a bit about AT&T’s former Long Lines division, which for a period was a series of microwave towers placed around the country to allow long-distance calling. For example, here’s an article from 1948 about the link between NYC and Boston. 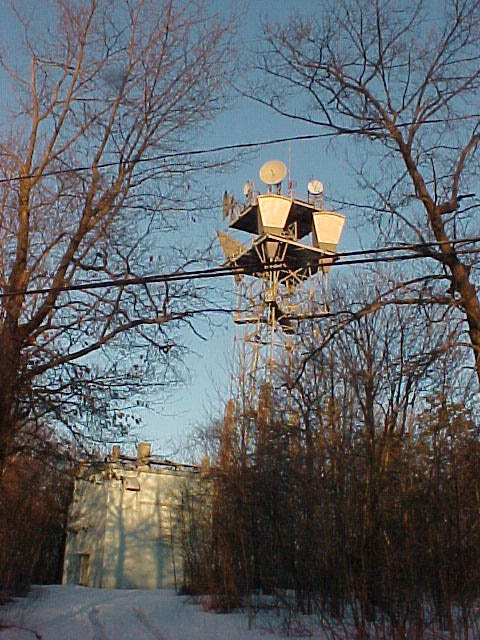 They had a series of distinctive towers, with the odd stuff on top being highly-directional microwave horns. What’s interesting to me about fiber is that the capacity is seemingly infinite. While 100Gbps Ethernet is just emerging (and presently only available, AFAICT, for links between switches), that’s grossly insufficient for, say, major Internet backbones. So places just multiplex many signals onto a single strand, known as Wavelength-division multiplexing, or WDM. Present capacity is now in the range of terabits per second on a single strand. Makes me wonder what things will be like in another 30 years.